Do you need to write a research paper this semester, but you can’t think of an intriguing topic to research? Several of the library databases have lists of current topics, from affirmative action to video games, with links to relevant newspaper and/or journal articles. Open the Newsbank database and you’ll see links to current topics in the left-hand frame. There are also quite a few special reports, which include background articles, statistics, maps, images and websites, on selected topics. The Opposing Viewpoints in Context database also lists many current topics with links to various viewpoints from newspaper articles, journal articles, statistics, maps and primary sources. 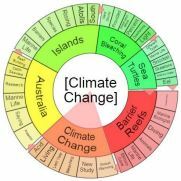 If you are a visual learner, try the topic finder visualization wheel in the Academic OneFile database. Broad topics are located in the center of the wheel, while more specific topics are on the outer edges. This database also shows trending articles, with more popular topics in red and orange, and less popular topics in green or yellow. and clicking the “View It” link under any title that has the “Online access” symbol. You can then browse through some of the topics to see if any grab your attention. Scanning through your textbook may also give you more ideas for possible topics. To focus your topic, try using the five W’s. For example, WHO does the topic involve or affect- do you want to focus on one group? WHEN has the topic been relevant- do you want to compare time periods or examine just one? WHAT are the major points of debate or perspectives on your topic? WHERE is your topic important- at a local or national level? WHY is the topic important or interesting to you? You can also look at the articles and information you find on your topic– if you find too many, you may need to narrow your focus, but if you find too few, try broadening your perspective. Finally, if you have trouble finding information on your topic, remember that your UDM librarians are available to help!